It’s no coincidence that gardens aimed at interactive health and healing have been popping up in prisons, hospitals, nursing homes, and in community centers for homeless populations and at-risk youth. It turns out that deep sense of well-being you get from an afternoon weeding and pruning isn’t all in your head. A Dutch study asked two groups to complete a stressful task. Afterwards, one group gardened for 30 minutes, while the other group read indoors. Not only did the gardening group report better moods than the reading group, they also had measurably lower cortisol levels. Cortisol, “the stress hormone”, may influence more than just mood: chronically elevated cortisol levels have been linked to everything from immune function to obesity to memory and learning problems and heart disease. 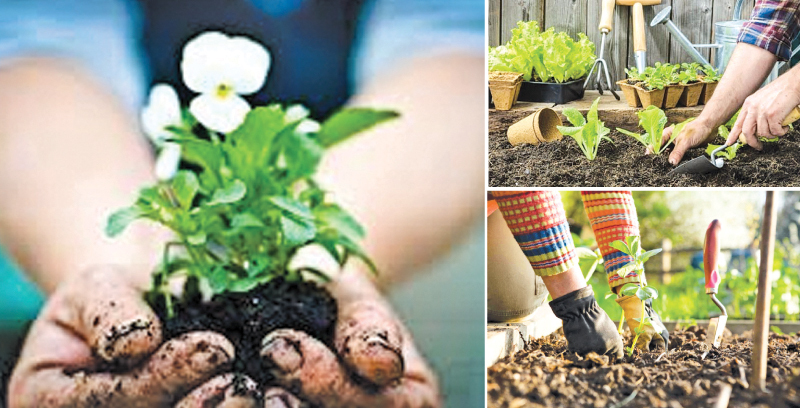 It may be more than brain hormones causing higher self-esteem scores for gardeners: there’s no more tangible measure of one’s power to cause positive change in the world than to nurture a plant from seed to fruit-bearing. Gardening may be just one way to achieve your target 2.5 hours of moderate-intensity exercise each week — but gardening provides a rewarding motivation that makes it happen, unlike a treadmill, which invites associations with hamsters in wheels. A large Stockholm study showed that regular gardening cuts stroke and heart attack risk by up to 30% for those over 60. As we age, diminishing dexterity and strength in the hands can gradually narrow the range of activities that are possible or pleasurable. Gardening keeps those hand muscles vigorous and agile without oft-forgotten exercises such as a physiotherapist might prescribe. Related research has inspired rehabilitative programs for stroke patients involving gardening tasks as a satisfying and productive way of rebuilding strength and ability. One long-term study followed nearly 3,000 older adults for 16 years, tracking incidence of all kinds of dementia and assessing a variety of lifestyle factors. Researchers found daily gardening to represent the single biggest risk reduction for dementia, reducing incidence by 36 per cent. Another study estimated the risk reduction at 47%! Why does gardening make such a difference? Alzheimer’s is a mysterious disease, and the factors influencing its incidence and progression remain poorly understood. However gardening involves so many of our critical functions, including strength, endurance, dexterity, learning, problem solving, and sensory awareness, that its benefits are likely to represent a synthesis of various aspects. This one is a wild card. Not only does the Vitamin D you’re soaking in from the summer sun help you fight off colds and flus, but it turns out even the dirt under your fingernails may be working in your favor! The “friendly” soil bacteria Mycobacterium vaccae — common in garden dirt and absorbed by inhalation or ingestion on vegetables — has been found to alleviate symptoms of psoriasis, allergies and asthma: all of which may stem from an out-of-whack immune system. This particular organism has also been shown to alleviate depression, so go ahead and get your hands dirty. Researchers are still speculating how our immune system may interact with our brains and play into a variety of mental health issues in addition to our ability to fend off infection: inflammation may provide the key link.